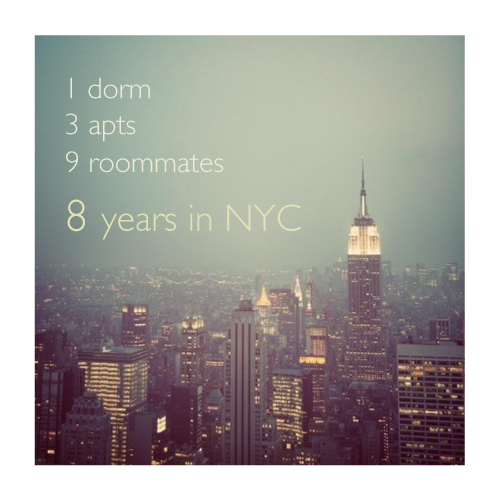 8 years — cathie u.
I moved to New York on August 23, 2003. I started the Master's Program for Art Therapy at the School of Visual Arts. I lived in a single dorm room and moved out after a semester, once I had a mouse problem. Luckily a good friend was moving to NYC around that time, so we rented an apt in the Upper West Side. I lived there for about 4 years then moved to Chinatown. Talk about change of environment. We only lasted less than a year there and moved to Gramercy. Funny how things come in full circle, my current apt is a block away from my old dorm building. Almost all of my roommates that I've lived with in the past 8 years, moved back to CA or to their respected home towns. Whenever I go home to visit, I get asked the question, "So when are you moving back?". I don't know the answer to that. I'm fortunate enough to live here and experience this crazy, fast moving city for so long. In all honesty though, I don't think I would have survived without the support of my family and friends back at home. And it helps a great deal to have some good friends here to keep you sane. So to all of you, thank you. Tags: New York, cathie u.